This film, released early in 2014 in the US, is a must-see, especially for fans of historical dramas and Jane Austen! 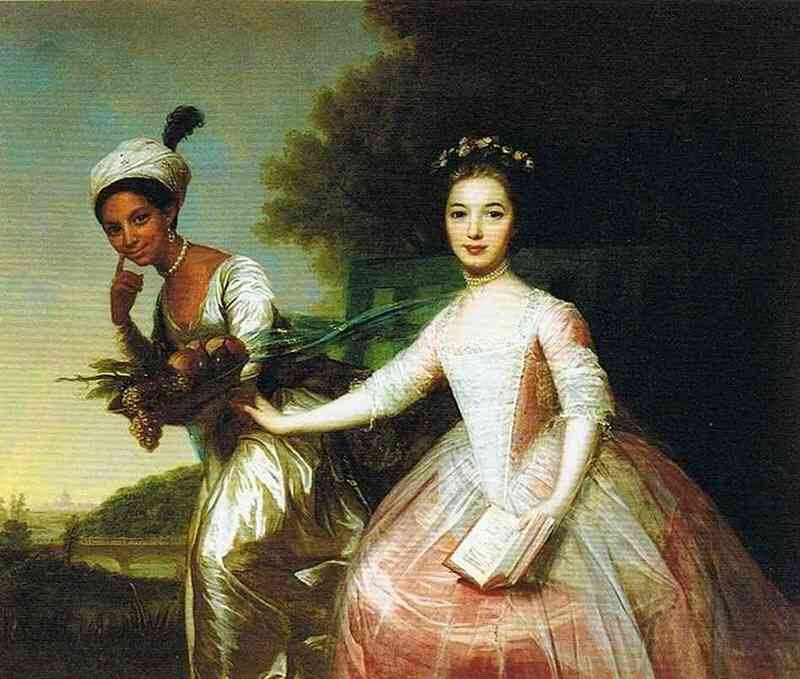 Issues of class privilege, marriage/property, and slavery arise. In the portrait (above), the viewer’s eye is drawn to Dido, who seems full of vivacity, while her cousin seems more proper/sedate. 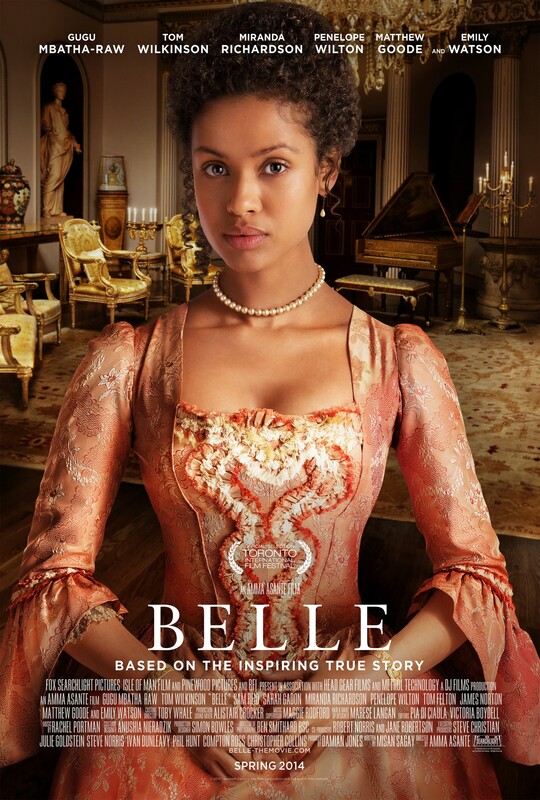 The young Belle is brought by her naval officer father (Matthew Goode) to live in the household of his childless uncle, William Murray, the first earl of Mansfield (Tom Wilkinson, superb as ever) and his wife (Emily Watson, in a low-key role). All we know is that the child’s mother was an African slave found aboard a Spanish vessel. Already living on the vast country estate is another girl, Elizabeth Murray (newcomer Sarah Gadon), the daughter of another of Lord Mansfield’s nephews. The girls grow up together, like sisters, though Belle is of a different status (too high to dine with the servants, yet too low to dine w/ the family). Lord Mansfield is also Chief Justice of the Royal Court, and as in the film, the real Dido assisted her great-uncle w/ his daily correspondence. I especially enjoyed the debate/discussion scenes between these two! The idealistic son of the local parson, John Davinier (newcomer Sam Reid, a solid performance) comes to study law with Lord Mansfield. He mentions an important court case involving slave cargo, and she wants to learn more. In a February 2013 article, “The Daily Mail” (UK) summarized the findings of a University of Mary Washington study conducted in the United States, then published online in the Journal of Child and Family Studies. Study participants were college students between 18 and 23 years of age who had overbearing parents as children. The researchers said parental involvement was important, but too much increased a child’s likelihood of suffering depression and decreased their satisfaction with life and ability to get along with other people. “Parents should keep in mind how developmentally appropriate their involvement is and learn to adjust their parenting style when their children feel that they are hovering too closely,” lead researcher Holly Schiffrin said in a media release. “There is a lot of pressure involved with helicopter parenting –– it affects the children’s self esteem and confidence because they are not given the opportunity to develop themselves,” she said. Hamilton said it’s understandably difficult for modern parents to protect their children from danger but also help them develop independence. Strict parents steal your confidence, they don’t let you develop properly and find your inner self. They make it difficult for you to be an adult who knows what he or she wants you are so scared to have an opnion of your own. It affects your relationships with boyfriends and mates. As you are afraid to speak out for yourself… Emotionally you can’t develop into a strong well balanced person if your parents are shadowing your every more. It instills fear at times and there are enough things in life that are scary without having your parents stop you from becoming as wonderful as you can be by controlling your every move. The control mechanisim is done out of fear, and insecurity on their part. It is sad to think that they are so confused this way, but, unfortunately, it has life long effects, if they are not taught to be better parents. It makes them [children] rebel and then it also stagnates them from making the real decisions they need to make when they are free of their parents because they always doubt themselves. To this day, I am always looking for acceptance and always second guessing myself because my parents were always so on top of me. It’s like you don’t want them on top of you to begin with, but then when they aren’t anymore, you don’t even know what to do with yourself, you don’t even trust your own judgement, because they always told you you were wrong. Let me first explain how I define emasculated. Many people define emasculated as an overly controlling guy, who suddenly has to work for a female manager, and now he feels “emasculated.” That’s just one definition, but it misses the bigger point. When men have controlling fathers, the effects manifest themselves in a few ways. They become controlling, too. As soon as they get out on their own, they decide they will never be dominated again, and seek to dominate. They can also go the opposite way. They see how much pain a domineering alpha male wannabe causes at home, and they want nothing to do with it. When men have controlling mothers, even those who do this out of love, it has the same effect. However, it also creates resentment. You will see unexplained hostility toward women. When a woman asks a guy for a simple favor, he gets upset. If she dares ask him to do something that is expected in traditional roles, like repairing something, he boils over. He alternately needs her approval, but he resents the fact that he’s a mama’s boy because everybody sees it. If they don’t see it, he thinks they do. He also fails to inspire any confidence in girls he courts because they sense that he will not stand up for her. Women look for guys who will look out for them. If they sense that a guy is a weakling, they have little use for him. Constant criticism erodes self-confidence. From my own experience, the emotionally happiest and healthiest people I know (amongst academic high achievers) all have good relationships with their parents and were never poked and prodded into high academic achievement. They were able to get far academically due to their own intellect, motivation, and determination, of course with loving encouragement (not prodding) from their parents. Always remember the effects of selection bias. The kids graduating from these top-ranked schools and getting good jobs are a highly select sample of young people who have extraordinary intellect and motivation, and much of that comes from genetics, environment, peers, or luck, and NOT parental intervention. If you are a parent, just because you see so many kids graduating from Harvard getting $100k starting salary jobs doesn’t mean that if you drop your own kid into Harvard, he will magically come out with a $100k starting salary job. Your kid needs to have that intellect and motivation; without them, he will wallow in depression because you expect so much of him, but he simply doesn’t have the ability to deliver what you desire. Unlike the philosophy of many Asian parents, not everything can be taught to everyone. Some kids are simply not made to go down a top-ranked academic path. They may have strong skills in other areas, such as mechanical hand skills or people skills, and are thus better-suited for different professions. There should be no shame in your child being a car mechanic, if he simply can’t do well in school, no matter how much you force him to try. If fixing cars is what he’s good at, and he aspires to open his own small car body shop (which can be a stable and profitable business in the long run), it’s useless to try to push him into becoming a brain surgeon. All parents have dreams for their children but the overbearing ones really make it obvious that their love is conditional upon the fulfillment of their expectations. Which social groups tend to have above-average concentrations of overbearing parents? In North America, that would be immigrants. People immigrate for all sorts of reasons. The biggest delusion that immigrants have is the “for a better life” myth that they chant to whoever they’re pandering to, and this is otherwise known as the “American Dream.” The people who feed their children and others this lie don’t have a concrete reason for immigrating, such as an educational or occupational opportunity (in other words, their own life fulfillment), but rather some vague dream about rainbows paved with gold. These are hurt people, disenchanted with life in their homeland, and this hurt could go back several generations. Often, they do not know the exact reasons for their distress. They could have been from a fallen family, whose wealth or status was lost by tragic means, such as those stemming from political winds of change. However, these families’ values and high standards remain intact, and as a result their offspring are doomed for generations to carry out the plan to regain what was lost. Children of overbearing parents should try to find out more about their family background, by speaking with relatives, traveling to the ancestral homeland, in order to gain insight into what social or familial forces shaped their parents’ behaviour.